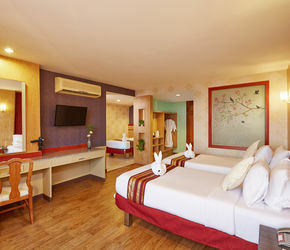 We are proud to present you one of the most respectable hotels in Pattaya. Eastern Grand Palace has been a home away from home for travelers all over the world since 2004. We have been offering our service ranging from accommodation, seminar and banquet facilities, to food and catering to guests from all over the world. 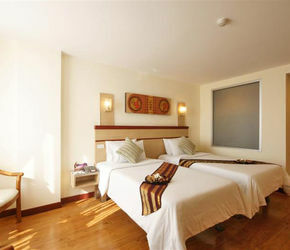 Locating a bit off the main street, Sukhumvit road, our guests have enjoyed the benefit of easy and convenient traffic and relax life, while being able to reach both the city and all attractions outside the city easily. We hope that you will find us to be the answer for your trip to Pattaya. Meeting and convention facilities are available for guests conducting business. Guests have a choice of three restaurants to dine at. Free-form swimming pool with Jacuzzi. 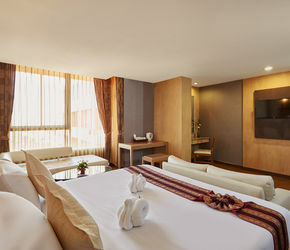 All rooms are equipped with aircon for maximum comfort. Free shuttle bus to the beach running twice daily. Unlimited Free WiFi throughout the property.